Media outlets continue to rehash news reports claiming that missing Saudi writer Jamal Khashoggi has been killed inside the Saudi consulate in Istanbul, despite statements from Turkish President Recep Tayib Erdogan himself, who refuted the claims and said he is hopeful the writer will emerge unharmed. The question really is, how did international media outlets fall prey for the initially weakly-sourced news report, and another false report that was later deleted, as well as citing an unknown woman? “The night of the deleted tweets,” as many observers have termed it online, seems to explain it all. Prior to last Friday, media outlets affiliated with the outlawed Muslim Brotherhood and Qatar carried a news report that claimed that Saudi Arabia had detained Khashoggi inside its consulate in Istanbul. The Saudi Crown Prince refuted the claims later in an interview during which he said Turkey can search the kingdom’s consulate in Istanbul for the Saudi journalist, saying: “We have nothing to hide”. On Friday, a team from Reuters news agency entered the consulate and made sure Khashoggi was not there. 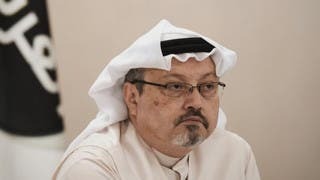 Reuters then contacted Turkish security requesting a comment on the matter, and according to Turkish reports, the agency was informed that there was no other reasonable theory to explain his absence, other than Khashoggi being killed inside the consulate and his body being removed from the premises. Hence, Reuters published an "Exclusive report" that cited a theory, and weak, unnamed sources claiming that Turkish police believe Saudi journalist Khashoggi was killed in consulate. In fact, Reuters did not provide any additional information about these sources. 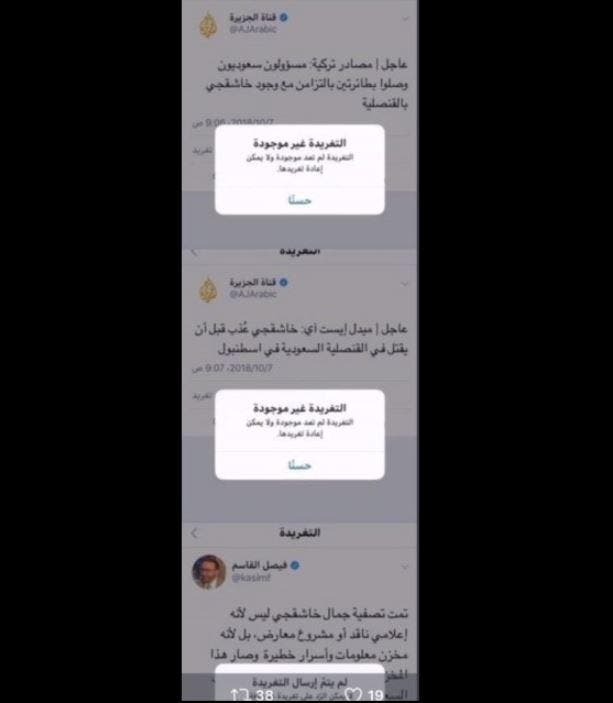 At around 12:51 Friday-Saturday night, the news report appeared in a very synchronized manner on media outlets affiliated with Qatar and all social media accounts belonging to the Muslim Brotherhood, which some of them operate from Turkey. The false news reports kept circulating the next morning, before President Erdogan denied the murder claims, saying he was following up on the case himself, saying that he is hopeful for a positive outcome. Though he is the first responsible in Turkey, he did not confirm Reuters report. 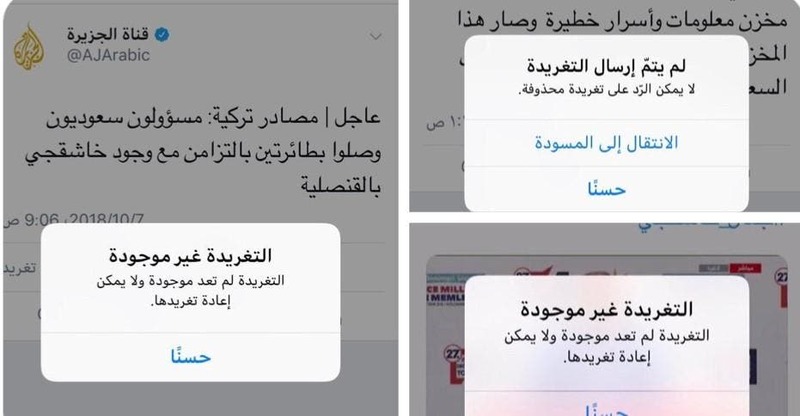 At the same time, many started to ridicule Reuters, the Brotherhood outlets, the Qatari and international media for adopting a fake account and an unknown source that the president had refuted. Shortly before, thousands of accounts started concurrently to accept condolences on Khashoggi’s presumable death, and Al-Jazeera Channel quoted correspondent claimed that Khashoggi’s body had been found, and that his burial and funeral would be two days later. It then deleted a tweet and omitted the story which could still be found in other outlets. In another contradiction, a Muslim Brotherhood-affiliated news website based in London, claimed that Khashoggi had been tortured inside the Saudi consulate. Moreover, Qatari media alleged that the body the Saudi writer was cut off into pieces and has been charged out of the consulate. Then, the Qatari channel omitted the story. The Turkish Anadolu News Agency claimed that 15 Saudi employees had arrived at the Saudi Consulate in Istanbul while Khashoggi was there, and they left after his death. After that the agency tweeted in correction: “The Saudi security delegation arrived Sunday at the Saudi Consulate in Istanbul, days after journalist Jamal Khashoggi disappeared”. This made one of Khashoggi’s friends upset, a Kuwaiti activist, Mohammed al-Awadi, who apologized for tweeting his condolences. However, Khashoggi’s other friend, the well-known Brotherhood leader Azzam al-Tamimi, expressed his disappointment regarding the Turkish denial and strongly criticized Erdogan for that. As many are waking up to the discrepancies in the media; the Qatari media keeps publishing opinion pieces and analyses based on this series of false news. The Jamal Khashoggi disappearance: An orchestrated campaign?